(Money Magazine) -- Is Dad mixing up his pills? What happens the next time Mom falls? If you have an elderly parent, chances are you've spent more than one sleepless night worrying about such things. Sure, moving him or her to an assisted-living facility or a nursing home might help. But the average annual cost is $38,000 and $67,500, respectively, and that doesn't include the hefty emotional price: Surveys show that seniors fear nursing homes more than they do death itself. Thankfully, the past few years have seen a boom in technical innovations that can prolong their independence and help you to be a more effective caregiver, even from afar. They include automatic activity sensors, smart pillboxes, and communicators that share health data with you or a medical pro. These gizmos (and the monitoring services that typically come with them) can be pricey, ranging from a few hundred dollars to several thousand a year -- and neither Medicare nor most private health insurers typically cover them (though some will if they're prescribed by a doctor). Still, because these devices can extend the time your parent is able to live safely at home, the best ones may save money and heartache in the long run, says Laurie Orlov, founder of market research firm Aging in Place Technology Watch. "We've entered a really great new world," she says. Navigating this new world isn't easy: There's little regulation or independent testing of many of these products. And it's hard to comparison-shop because many manufacturers don't post prices on their websites or quote them over the phone but rather direct you to salespeople. So MONEY interviewed a dozen experts who are familiar with the latest elder-care technology -- and identified cost-effective choices for three challenges, starting with the most common. The Challenge: Mixing up pills, forgetting them, or taking them at the wrong time can have dire consequences. "It's one of the primary reasons elders can no longer live alone," says Elinor Ginzler, a vice president at AARP. The Old Fix: Those $2.99 plastic pillboxes you get at the drugstore, with a compartment for each day of the week. Many pharmacists will pre-sort meds into them. But seniors who are forgetful or have complicated drug regimens need more help, says Julie Menack, a geriatric-care manager in Oakland, Calif. 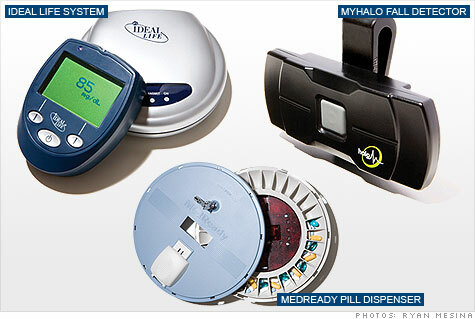 The New Fix: High-tech pillboxes that set off alarms if your parent fails to take a dose. They range from basic $17 models to $75-a-month machines that connect to a monitoring service via a phone line and send alerts if pills are missed. Jeffrey Gornstein, the founder of comforthouse.com, a seller of household gadgets, says he's been pitched dozens of these devices, many of which have "terrible instructions or buttons that are too small." A good pick for most people, experts say: the pie-dish-size Med-Ready 1650FL (medreadyinc.com; $218 and up, plus $16 a month). Load prescriptions into a carousel, then program it to open internal boxes up to four times a day. Mom doesn't take a pill on schedule? The MedReady flashes and beeps. If the meds haven't been removed after 30 minutes, the device sends voice or text messages to you or another caregiver. Since her parents got the MedReady, says Karen Ballou, 53, of Livermore, Calif., they've stopped sleeping through their scheduled pill-taking times: "It's a blessing for us as caregivers." The Caveat: If an alarm will upset your parent, or if he or she might not swallow a pill after removing it, this isn't a good choice. Covered by health insurance? Not by Medicare or big private insurers. Most long-term-care policies (and Medicaid in 16 states) will cover it if prescribed. The Challenge: Installing grab bars and making other home modifications reduce the risk of falling but don't eliminate it. Research shows that seniors who get quick help after a tumble are about 20% less likely to need hospitalization. The Old Fix: One of those "I've fallen and I can't get up" pendants. Many seniors are reluctant to wear the conspicuous devices because they advertise frailty. And a 2008 British study of people over the age of 90 who wore such pendants found that 80% never pushed the alert button after a fall, either because they didn't want to bother anyone or were unable to do it. The New Fix: A wearable device that can automatically sense falls, thanks to a built-in accelerometer that measures movement and orientation. When it detects a fall, it sends an alert, typically to a monitoring service and to you. Several companies now offer such devices, which run from $30 to $60 a month, hardware included. Among them, Halo Monitoring's MyHalo (halomonitoring.com; $49 a month) was singled out for an award recently by a panel of nurses and caregiving pros assembled by a health trade publisher. MyHalo looks like a pager and can be clipped to a belt. When it detects a fall, a base unit plugged into a phone line beeps. If your parent doesn't hit the unit's reset button, you get a voice or text message, and a Halo staffer calls your parent's home (then you if there's no answer). Can't get over there right away? Halo calls 911. Choose this device only if you're confident your parent will wear it and keep it charged. Otherwise, says Stacey Pierce, a certified aging-in-place specialist in Charleston, S.C., you're better off installing a fall-alert system in his or her home. The latest include wireless motion-detecting sensors that can alert you if they don't pick up movement typical of your parent. For example, if Dad gets the paper and eats breakfast every morning, put sensors on the front door and the refrigerator and program the system to call or text you if they aren't opened by, say, 9 a.m. Installing such detectors kept Karla Barham, 52, of Shreveport, La., from having to rush to her mother's apartment in a panic several times a week whenever her phone calls went unanswered. Now Barham spends her time with Mom cooking dinner or going out: "We have a much better relationship." BeClose (beclose.com; $300 for enough hardware for a small apartment, plus $49 a month). Covered by health insurance? Usually not. But these devices are covered by some long-term-care policies (and Medicaid in 44 states) if prescribed by a health pro. The Challenge: Seniors who fail to follow standard medical guidelines for chronic ailments such as diabetes and heart disease -- for example, neglecting to measure blood sugar or pressure -- get sicker and have to be hospitalized far more often than those who do. The Old Fix: Blood-pressure gauges and other devices for home use. But there's no way to check that your parent is using them or to read results remotely. The New Fix: "Telehealth" devices that automatically transmit data to medical pros or caregivers. A recent Department of Veterans Affairs study shows that people with chronic conditions who use the kind monitored by doctors are 20% less likely to wind up in the hospital. What's more, they're keeping more than 49,000 veterans from having to enter nursing homes, says Adam Darkins, a physician who oversees the VA's telehealth program. One system proved effective in Medicare and VA studies: the Bosch Health Buddy (boschtelehealth.com; available only by prescription). A small video console plugs into your parent's phone line; another device -- a blood-sugar monitor, for example -- gathers data. The console reminds your parent to use the monitor and transmits the reading to his or her doctor's office. The doctor's staff keeps an eye on the info and intervenes if necessary. "It really gives me peace of mind," says Shelley Costello, 57, of Wenatchee, Wash., whose 81-year-old mother uses the device to keep tabs on her high blood pressure. However, most medical pros don't yet work with the Health Buddy. Your parent's doctor doesn't? Researchers at the University of Miami's Center on Aging found an affordable and user-friendly alternative: Ideal Life (ideallifeonline.com; $200 to $450 upfront plus $8 to $50 a month). The main difference: This system doesn't automatically send health data to a doctor but to you (or someone you designate), via a smartphone alert or a website you can check. The Caveat: Getting the data yourself won't do much good unless you know how to interpret it. Consult your parent's doctor to find what numbers are worrisome and what to do if he or she hits them. Does Insurance Cover It? Usually, if the system is prescribed and overseen by a health pro. Fortunately, competition to provide newer and better elder-care aids is accelerating, which promises to drive down prices, Orlov says. That's good news for older Americans -- and for caregivers who want to help their parents stay at home, worry-free, as long as possible. Parents who won't take advice from their children will often accept it from professionals. Get these three on your team. Who they are: Typically nurses or social workers with special training in elder care. What they do: Help figure out what kind of care your parent needs and where to find affordable (or free) assistance, says Linda Fodrini-Johnson, a certified geriatric-care manager in San Francisco. Typical fee: $160 to $400 for an initial two-hour consultation; $80 to $160 an hour after that. Who they are: Contractors who have passed classes and tests in home design for the elderly. What they do: Recommend and carry out home modifications to reduce the risk of falls. Typical fee: $250 to install grab bars in the bathroom; more elabo-rate renovations can cost well into the thousands, says Louis Tenenbaum, a certified aging-in-placespecialist in Potomac, Md. Who they are: Health pros such as occupational therapists who have passed courses on driver training, safety, and rehabilitation. Typical fee: $300 to $500 for a two- to three-hour assessment; $500 to $700 for a typical five-session retraining course.